This aerial shows Nissan stadium and its many parking lots. The adjacent property at the bottom of photo along the Cumberland River belongs to PSC Metals. It is plenty big enough to locate a new soccer stadium. NASHVILLE, TN – At Large Councilman John Cooper says there are only three things wrong with building a soccer stadium at the Tennessee State Fairgrounds: location, location, location. Cooper told the Tribune he had a better idea: build it downtown where plenty of parking and hotels already exist. Three properties on either side of Nissan Stadium fit the bill. Gerdau Ameristeel owns the land along the Cumberland River next to James Robertson Parkway. The Tampa-based company owns about 5 acres valued at $2,078,400. It is next to Nissan stadium parking Lot F. It’s not big enough for the MLS soccer stadium which will take about 11.5 acres. However, the TA Truck facility next to Gerdau is 16.72 acres. It is also on James Robertson Parkway and Lot E is across the street. The land is valued at $4,970,900. PSC Metal, a scrap metal salvage business, owns 4 acres, valued $522,700 right next to Lot N, a stone’s throw from Nissan Stadium. PSC Metal also owns several adjacent properties, about 14 acres and they are worth about $3 million. Cooper says the 10 acres at the Fairgrounds the city plans to give to MLS team owner John Ingram, are worth about $50 million. Ingram said the land the city would lease to him for private development is a crucial part of the $275 million stadium deal. “If the soccer deal hinges on bringing development to the Fairgrounds why not build the stadium where we already have development and adequate parking? The Fairgrounds has neither,” Cooper said. He said putting the stadium at the Fairgrounds would likely kill the flea market which the Fair Board is mandated to preserve but vendors aren’t buying it. Initial plans did not show the stadium perched on the top of the hill. Vendors want to keep their current spots. However, the stadium was located on top of the hill in the design that went before the Planning Commission for approval last month. In the latest version, the flea market vendors and other Expo buildings were moved down the hill. Shane Smiley, Chairman of the Flea Market Vendors Association, says the architect of the Fairgrounds soccer deal is Rich Reibling. Smiley said Reibling has wanted to develop the Fairgrounds since the 1990s when he was Fair Board chairman. 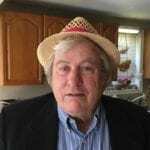 Reibling has worked for the last three Nashville mayors and was Barry’s Chief Operating Officer. His departure from the Briley administration was reported by the Tennessean in June but he was seen in City Hall last week. “This latest proposal simply undermines the will of the people to fulfill his quest,” said Smiley. “The reduction of acreage for the current events can only harm them, not help them,” he said. 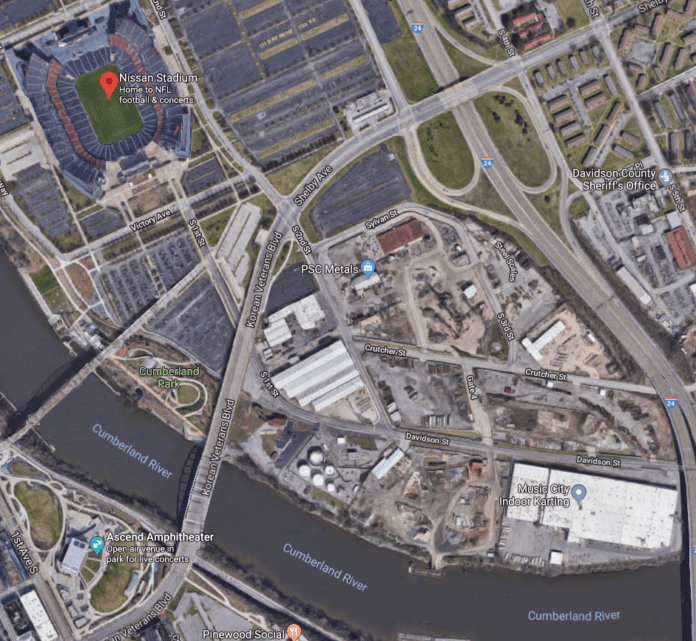 In order to build a soccer stadium next to the Titans venue, Cooper said the city would need to buy land on the East Bank or across the Cumberland River from the Ascend Amphitheater. He said investing as much as $50 million to protect a $225 million investment makes sense. The city could buy the land it needs next to Nissan stadium for much less, probably around $10 million. “Instead of being a complete win for the city and have two great things, a well-located soccer stadium and a Fairgrounds you are going to end up with a badly located stadium and just the remnant of the Fairgrounds,” Cooper said. The flaw in Cooper’s plan to build the stadium in a better place can be summed up in one word: politics. The city council meets on Tuesday, August 21, for a crucial second vote on three resolutions that will still need a third and final vote to seal the soccer stadium deal at the Fairgrounds. Fearing the council votes aren’t there to reject the Fairgrounds plan, Cooper and Councilwoman Tanaka Vercher are proposing to let the public decide on the deal by referendum in the November election. It is clearly a “Hail Mary” tactic designed to keep the city council from having egg on its face if it signs off on a deal and then later regrets it. Meanwhile the Fair Board has proposed to increase the soccer team’s yearly lease payment of $200,000 after thirty years on Ingram’s 99-year lease. Cooper wonders which city council will show up Tuesday—the one that agreed to spend $225 million for a MLS stadium the city will have to borrow money to build and which includes the giveaway of 10 acres of public land to a businessman–or the one that voted to keep General Hospital open despite former Mayor Megan Barry’s plan to close it? Development proposals originating in the Mayor’s office line up support from various city departments like the Planning Department. In the case of the soccer proposal that includes the Fair Board, the Sports Authority, and the Parks Dept. The City Council has to approve these deals. Cooper says they often benefit private developers at the expense of public interest and the public purse. The former convention center at Fifth and Broadway is a case in point. The Tribune has reported about the proposed deal to privately develop Fort Negley, a publicly-owned and historic park. The proposal fell through. During the Barry administration, a vote against City Hall would mean your district wouldn’t get new sidewalks or other amenities, and that’s how things worked under the former mayor. The Briley administration is backing the stadium deal although it was voted on during Barry’s administration. Cooper and Vercher are not suggesting the city should renege on the soccer deal. They are saying it’s in the wrong place and that the convoluted deal bears closer scrutiny. District 2 Councilmen DeCosta Hastings and District 1 Councilman Jonathan Hall favor building the soccer stadium in Metro Center. The office of the Nashville Assessor of Property provided research for this article.